"Sit back in your rocking chair with a latte, because our men will handle it all!" Call to Speak with a Live Person and Not a Machine! Rated: 4.8 / 5 based on 80 reviews! We jump for junk! If you have bulk trash, construction debris, or other unwanted materials, Course Hauling in Pasadena, Maryland, provides complete junk removal services. If the clutter is starting to close in on you, why not call us to haul it away. 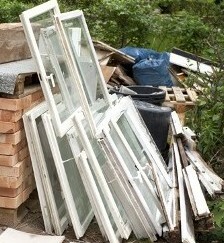 We have provided junk removal for many years, and we have the trucks and manpower to do the job quickly and correctly. A junky home or business is unappealing and overcrowded. Let us take the junk off your hands today! By providing same-day junk removal services, we move quickly to make room for something better for you. In addition, no job is too big or small for us. Whether you need us for a few big items or an entire mountain of junk, we can help. Your neighbors don’t want to look at the trash on your property and neither do you. Why wait around for the city trash service? They could take as long as a week. At the same time, they may not be able to handle the load. Depend on our junk removal team for prompt, affordable, and comprehensive services. Whether you are a homeowner or business owner, you are trying to save money. You simply cannot afford to hire a service that charges high price to remove your junk. After all, it’s only junk! Fortunately, the cost for us to remove your junk is much less than you might think. We offer free quotes and never charge hidden fees. Our friendly and helpful representatives are happy to assist you with any questions you have. Contact us to request a free quote when you need junk removal at your commercial property. We proudly serve residential and commercial customers in Pasadena, Maryland. 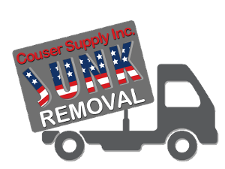 Couser Supply Trash & Junk Removal Services, Inc.
"ONE OF THE LAST CHEERFUL FAMILY OWNED AND OPERATED BUSINESS IN THE AREA!"